EXPERT LEVEL. 60-Card Preconstructed Deck. Torch the battlefield, then bring on the leaping hordes of destruction. "Deepwood Menace" keeps the table clear for oblivion's thundering approach. A ready-to-play 60-card deck of Mercadian Masques cards and a customized strategy guide. Rulebook not included. Look for these other Mercadian Masques theme decks. Look for these other Magic: The Gathering products. The Starter game and theme decks give you all the tools to play the Magic: The Gathering game, including complete rules and strategy tips. 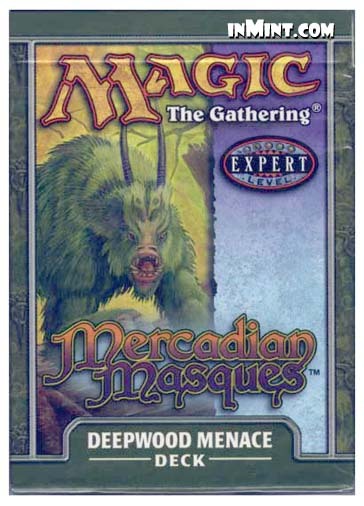 Magic: The Gathering - Classic products introduce the advanced level of Magic play. Build your own decks with new cards and new strategies. Expert-level boosters and theme decks, such as those for the Magic: The Gathering - Mercadian Masques expansion, give you the highest level of Magic strategy and collectability. Magic designed by Richard Garfield.